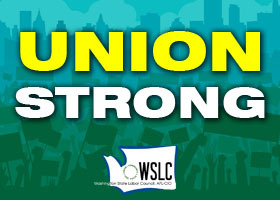 Hundreds of delegates representing unions across the state gathered July 17-19 in Wenatchee for the 2018 Constitutional Convention of the Washington State Labor Council, AFL-CIO. Under the theme “Union Strong,” the convention featured distinguished guest speakers and educational workshops focused on staying strong amid legal and legislative efforts to take away workers’ freedom to join together in unions. See the 2018 WSLC Resolutions approved by convention delegates. Check out The Stand’s summary of the July 17 and July 18 plenary sessions. Also, click on the following links to see TVW clips of some of the key speakers and presentations of those days’ plenary sessions.